Niroshika Hettiarachchi from the non-profit organisation ‘Women in Need’, addressing the European Union organised Gender Forum. 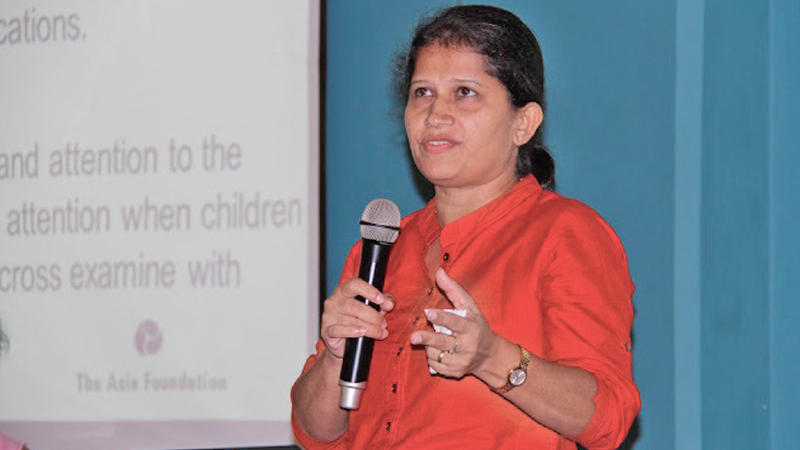 Aiming to ‘think equal, build smart, and innovate for change,’the Delegation ofthe European Union (EU) hosted a Gender Forum titled “Sharing gender-transformative approaches to peacebuilding in Sri Lanka” in celebration of International Women’s Day 2019. The event brought together ten EU partner organisations carrying out EU-funded projects in the Northern and Eastern Provinces to share how they are helping to address the structural inequalities which deny women equal participation in public and private life. EU Ambassador, H.E. Tung-Lai Margue, noted that gender equality is a fundamental European value enshrined in EU treaties, a political objective, and a driver of sustainable development and economic growth. “Bringing women’s issues into all our development cooperation projects, putting more money into it and discussing the rights and lives of women and girls is what the EU is doing not just in Sri Lanka but all over the world,” he added. This gender forum follows a similar event in December 2018 which focused on how EU partners in the Uva and Central Provinces are working to combat gender-based violence and to promote women’s economic rights.